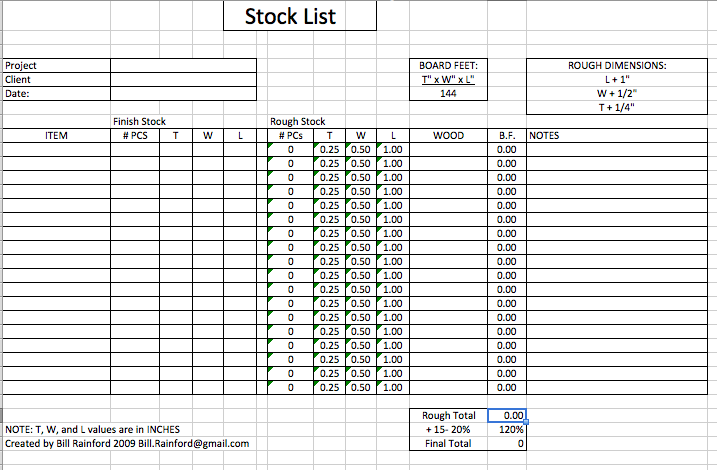 After drafting a new project or case piece but before you head to the lumber yard, you have to make a stock list. This inglorious bit of work is a necessary evil if you want to get all the necessary supplies on your first trip. 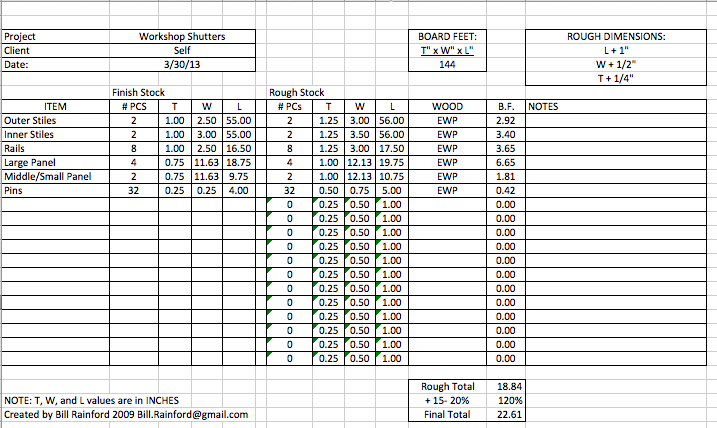 The past few weeks I’ve been working on drafting up several upcoming projects and as I used this spreadsheet a few times and thought it was worth sharing with you. Back when I was a student at the North Bennet Street School they had a nice little photocopy of a stock list that looked like it was originally made in Excel. We’d enter all the details for our project and then calculate the board footage for our projects by hand with a calculator. This often tedious work was susceptible to the occasional human error so I’d usually wind up checking and rechecking my calculations as I went. After doing this a few times, the computer scientist in me thought ‘Wait a minute, I can code this up in Excel and let it do all the work for me’ — plus printing this spreadsheet for a customer or when dealing with a supplier looks better than a hand written version.